The team also found that the Southwest Tributary of Pine Island Glacier, a deep ice channel between the two glaciers, could trigger or accelerate ice loss in Thwaites Glacier if the observed melting of Pine Island Glacier by warm ocean water continues down the ice channel. The results were published online in the Annals of Glaciology. "This is a potentially really dynamic place between these two glaciers, and this is somewhere where further study is really warranted," said lead author Dustin Schroeder, an assistant professor of geophysics at the School of Earth, Energy & Environmental Sciences. "If this tributary were to retreat and get melted by warm ocean water, it could cause the melt beneath Pine Island to spread to Thwaites." Sea-level rise has become a major global concern based on research showing extra ocean water from melting glaciers could swamp coastal areas around the world, contaminate drinking and irrigation water, threaten wildlife populations and hurt the economy. This new perspective on the Southwest Tributary shows melting beneath Pine Island may be currently or imminently causing the melting of Thwaites and speeding the rate of sea-level rise. "These results show that the ocean is really starting to work on the edge of this glacier, which means that we're likely at the onset of it having an impact," Schroeder said. The Thwaites and Pine Island glaciers in the Amundsen Sea Embayment are known as outlet glaciers, or channels of ice that flow out of an ice sheet. In recent years, they have become the focus of large international research efforts to better understand their potential impacts on sea-level rise. But measurements of the same areas over time are rare due to the high cost of building and operating airborne radars that collect information underneath ice. Looking at these two glaciers as a system involved a time-consuming process of building algorithms that interpret airborne data gathered from planes flying at different heights with unique radar systems, Schroeder said. Researchers analyzed 2004 data from a University of Texas survey using the UTIG HiCARS radar system and 2012 and 2014 data from University of Kansas surveys using the CReSIS MCoRDS radar system. "Our group is a combination of glaciologists and radar engineers, so we're particularly suited to the challenge of taking these very different radar systems and trying to figure out what you can see between them," said Schroeder, who is also a faculty affiliate with the Stanford Woods Institute for the Environment. Schroeder began working on the project during summer 2016 and collaborated with graduate student co-author Andrew Hilger, who is a member of Stanford's Radio Glaciology research group and the department of Electrical Engineering. The process has shifted Schroeder's outlook on how to approach collecting data about glaciers. "Even as we map and fill in the coverage, we should have in our portfolio of observations repeat coverage, as well, which is something that as a radar-sounding community we really haven't traditionally prioritized," Schroeder said. Just a repeat scenario of what's happening under Greenland right now. Unfortunately for the AGW crowd they won't be able to blame the Vikings for this, they've never been there, at least not so far as we have evidence of. Anyhow, whatever heat from below, it is the frigid air that creates 'surface' ice (eg, sea ice can form on ocean waters because of cold air-wind taking heat away with it). So if the air above is warmer than before, then the warming from below can have greater effect than before. Hence melting may increase and/or be present where/when it may not have been before, due to AGW warming of atmosphere taking less surface heat away than before. This makes even less sense than your Greenland glacier comments. 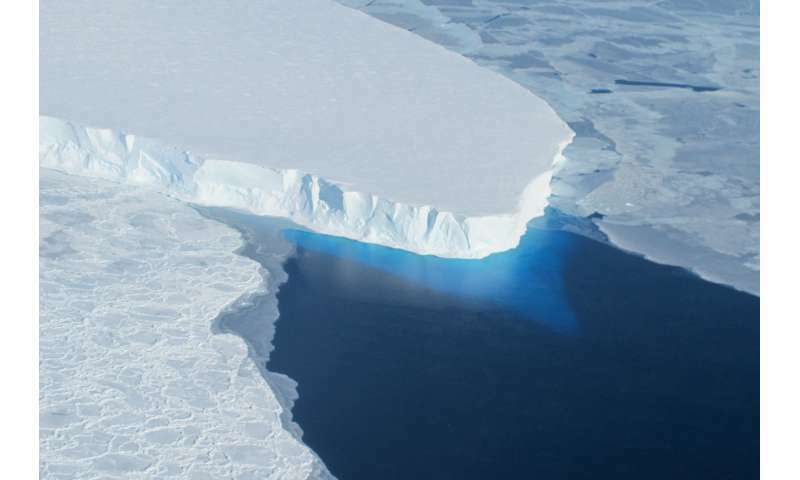 Antarctic land ice contributes to sea level rise so this accelerated melting is a real concern.